Cinnamon Babka is the ultimate breakfast bread. Our Cinnamon Babka recipe has chocolate lovers swooning for each slice. We’ve taken a classic cinnamon babka and infused it with decadent dark chocolate. It’s seriously the best chocolate cinnamon bread! Babka is a dense bread that is traditionally swirled with either chocolate or cinnamon and often topped with streusel or shiny glaze. Seinfeld hilariously shared his love for the popular Jewish bread in one of the episodes of his hit show in the 90s. 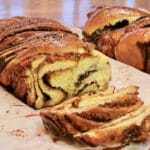 Cinnamon Babka has always been traditionally found at Jewish or Eastern European bakeries. Over the last few years babka enjoyed a renaissance and in Canada and America, can be found at cafes, bakeries and your favourite food blogs. 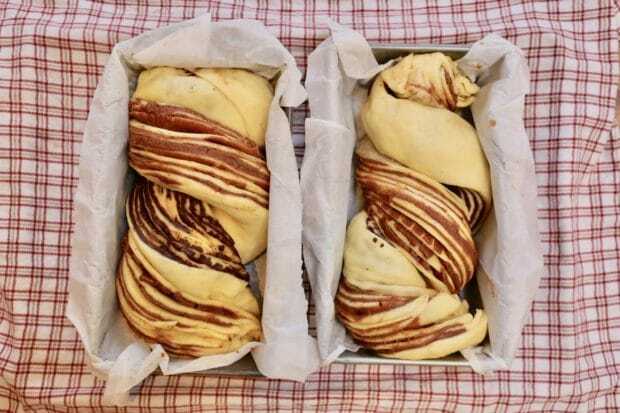 Babka is considered irresistible because of its contrast between slightly dry layers of bread and sticky swirls of chocolate or cinnamon spread. Babka is both dense and light at the same time, making it a perfect companion to your morning coffee. Babka sliced fresh out of the oven reveals a swirl of dark chocolate. Babka means “little grandmother,” in Ukranian, Russian and Eastern European Yiddish. For years babka has been a tradition in Jewish baking. On Shabbat, grandmothers would twist leftover scraps of challah with seeds and nuts. This reformed dough would produce a delicious Jewish babka, but far less sweet than the varieties we see today. It wasn’t until Eastern European Jews arrived in North America (like New York City and Toronto) that chocolate and cinnamon were added to the recipe. Chocolate and cinnamon were more affordable and easy to find in large urban areas in Canada and America. Today, Babka remains a beloved Jewish tradition, a popular Hanukkah dessert shared with family. Cinnamon Babka is a perfect breakfast for coffee lovers. You don’t have to be an expert in Jewish baking to perfect the art of babka at home. 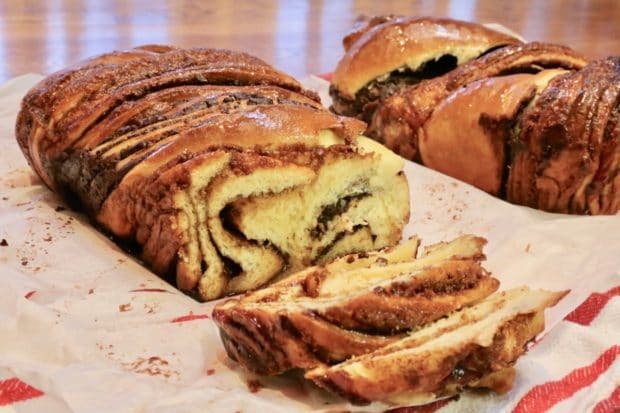 If you’ve got chocolate lovers in your family or love to drool over cinnamon buns this Cinnamon Babka Recipe is perfect for you! Jewish Holidays: serve for family and friends on Shabbat, Hanukkah or other special occasions. 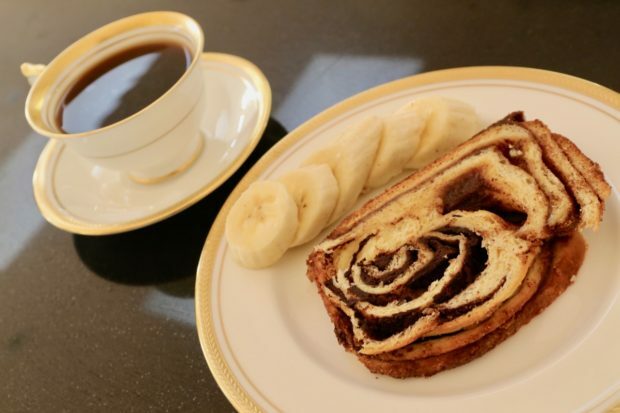 Breakfast: there’s no better way to impress guests than by serving breakfast or brunch with a slice of babka. Coffee and Tea Time: chocolate cinnamon bread is an excellent compliment for your next coffee break or High Tea. Decadent Dessert: serve a slice of chocolate cinnamon babka for dessert with a scoop of your favourite ice cream. Babka French Toast: take slices of day-old Babka and dredge in whisked eggs and fry in butter. A truly decadent brunch! Babka Bread Pudding: a great idea if you’re looking to use up leftover babka. Cut babka into cubes and place in a greased casserole dish with eggs and milk. Bake and scoop to serve with fresh fruit. Making homemade babka involves a few easy steps. We’ve included photos to showcase each major step and also have a detailed recipe you can print off at the bottom of the page. Mix dough ingredients together. Form a ball of dough. Let dough rise. Make simple syrup for Cinnamon Babka glaze. Prepare chocolate and cinnamon fillings. Once risen, split the dough in two and roll out into rectangles on a floured surface. Spread cinnamon and chocolate filling on each rolled out dough rectangle. Roll up dough lengthwise into a log. Cut each log lengthwise and then twist and braid cinnamon babka dough with chocolate. Let the braided babka proof in a greased loaf pan. 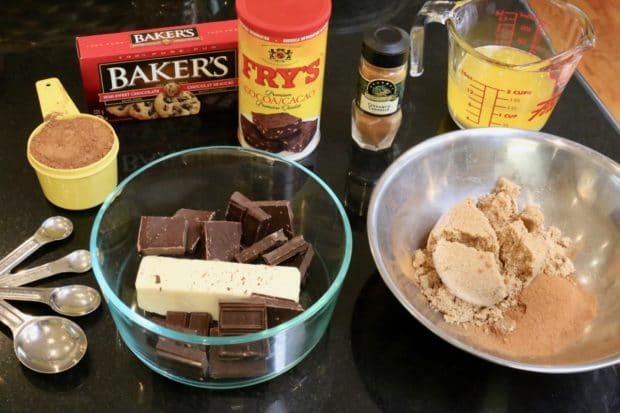 Prepare chocolate and cinnamon babka fillings. Split dough in half and roll out into a rectangle and spread with filling. Using a sharp bread knife, cut down the middle of each log, exposing all the chocolate and cinnamon layers. Babka rise in a loaf pan before popping in the oven. Brush Cinnamon Babka with simple syrup after removing from the oven. 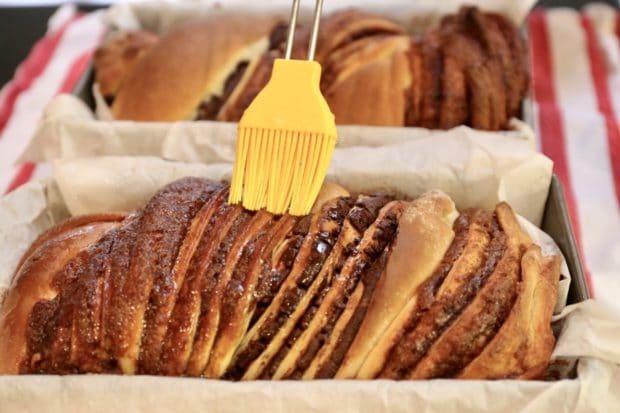 Cinnamon Babka is the ultimate breakfast bread for Jewish Baking enthusiasts. Our Cinnamon Babka recipe has chocolate lovers swooning for each slice. Heat milk to 110 F. Add yeast and a pinch of sugar to warm milk and allow to sit at room temperature for up to 15 minutes or until foaming. In the bowl of a stand mixer, combine flour, sugar, salt and nutmeg. Mix for 1 minute or until barely combined with dough hook attachment. Add yeast mixture and mix for 1 minute or until barely combined. Add eggs and mix on medium speed for 5 minutes, or until the dough pulls away from the bowl and forms a ball. Add half the butter, adding four 1 tablespoon at a time if the dough is too sticky. Cover with a clean kitchen towel and place in the oven with the light on and let rise for 90 minutes. Remove dough, punch down, cover with plastic wrap, and refrigerate overnight (or a minimum of 4 hours). Meanwhile, make simple syrup by combining sugar and water, and simmer for 15 minutes. Allow to cool completely. Combine cinnamon, sugar, and melted butter, mixing thoroughly until a spreadable paste forms. Melt butter and chocolate together on medium power in a microwave, stirring every 30 seconds, until completely smooth. Whisk in cocoa powder, and powdered sugar until a spreadable paste forms. Remove babka dough from the refrigerator, divide in half, and roll out to a 24 x 18 inch rectangle on a lightly floured counter. You should now have two rectangles rolled out in your kitchen. With a pallet knife gently spread chocolate babka filling on the first rolled out dough. Leave a 1-inch gap around all sides. Do the same with your cinnamon babka filling on the second rolled out dough. Be sure to leave a 1-inch gap around all sides. 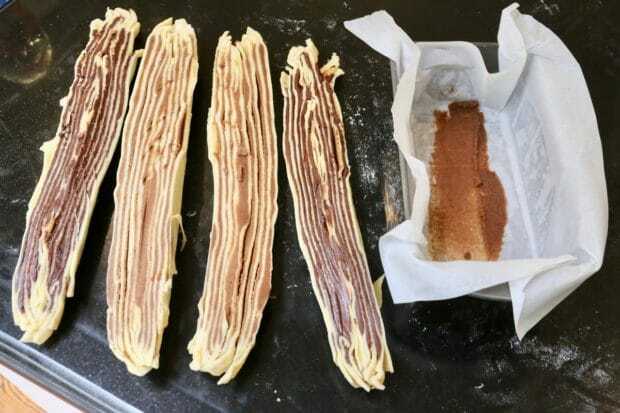 Roll each rectangle into a long log, and place in the freezer for 15-20 minutes or until firm. 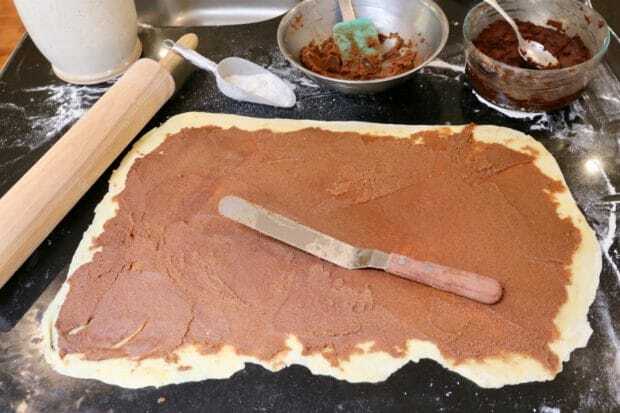 Remove both dough rolls from the freezer, and using a sharp bread knife, cut down the middle lengthwise, exposing all the chocolate/cinnamon layers. Hold the two halves of dough against each other so the cut sides are facing out, and twist into a decorative loaf. Place in buttered, parchment-lined loaf pans, cover with a damp towel, and allow to rise in the off oven for 2 hours. Preheat oven to 375°F and bake for 30-40 minutes, or until a tester inserted into the thickest part of the loaf comes out clean. Remove from the oven, place on wire racks, and immediately brush down with simple syrup. Allow to cool for at least an hour before slicing and serving.